Honestly, when Jodie and I got to Edinburgh we were absoluately crushed. It was a long night before as we didn’t have mats and had to sleep right on the cold floor in the Lake District. And, after a long drive and a couple meetings with a client in the city, we were both just ready for an early night. 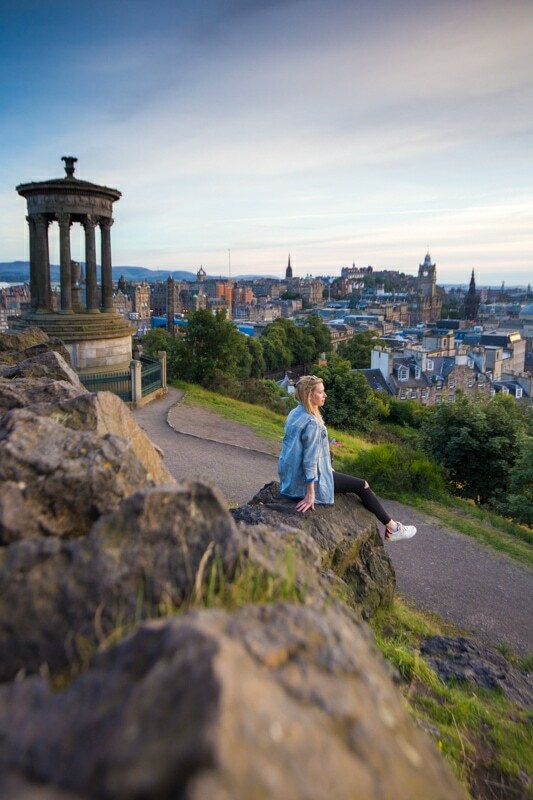 However, needing some content for my travel vlog, we forced ourselves out of our hotel and shot up Carlton Hill to photograph sunset. Instantly leaving the hotel I felt better. The city is just so stunning. And everywhere you look there’s a new photograph to be made. 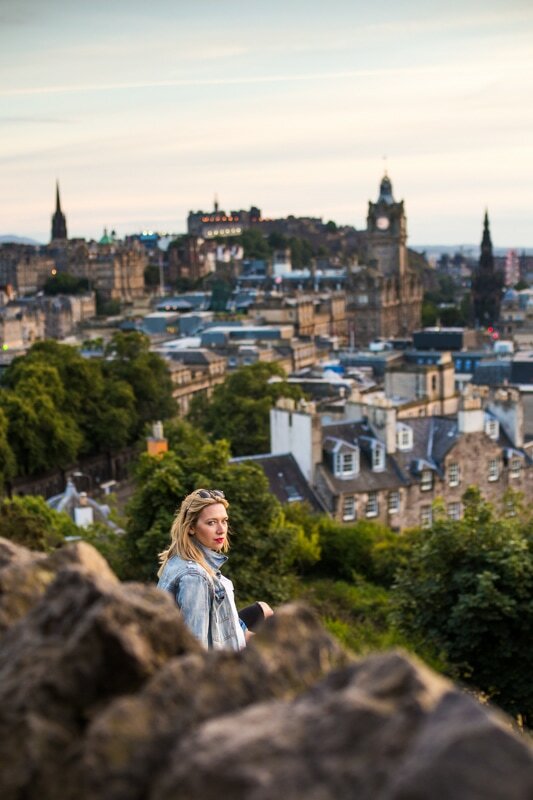 And, it actually took a lot of self-control to just force ourselves up the hill to shoot only one location in Edinburgh. The light wasn’t brilliant, but it did work extremely well for the type of photo I wanted to shoot. So, I thought I’d walk you through a set of my photos from this location in Edinburgh in today’s blog. This photo wasn’t easy to make. But, it wasn’t a challenge technically, or because the light was bad, but because there are so many people wandering around here at sunset that it’s hard to get a clean shot. But, with a little patience it was totally worth it. I took this image on my 70-200mm lens at f/6.3, 1/80sec., ISO500 @115mm. The aperture was 6.3 because I wanted to blur the background enough to put the focus on Jodie, but keep it recognizable. I love how it came out. I was waiting for the light to come down a little bit more, and it was getting a bit overcast in the sky, so I was kind of losing hope for nice light. But, we were sitting up at this view and I noticed a bit of golden light hitting the rock you see Jodie sitting on in this photo. So, I had her go out and pose there. Amazingly, the light moved up and hit her face. It was incredible, the only light in the entire scene was just right perfectly and soft on her face. I shot this photo at f/4, 1/80th sec., ISO 500 @21mm on my 16-35mm lens. The idea was to give a little bit of depth of field and blurred bokeh in the foreground using a low f-stop. Playing on my last image “lucky light”, I wanted to really play with that depth of field and get focuses on Jodie’s face, and the light hitting it. So, I switched to a 50mm f/1.4 for this image. I also wanted to hide the road below, so I got lower to the ground and rocks and really got locked in on framing Jodie’s face. 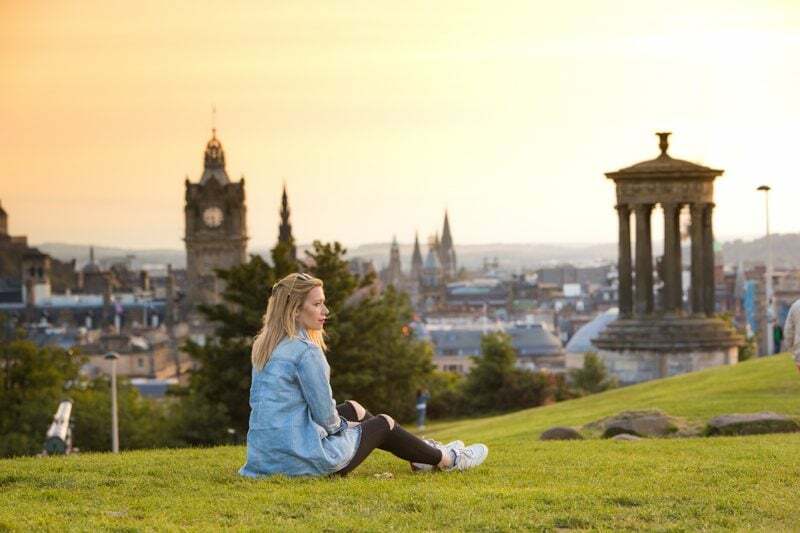 When I did my quick bit of research on where to photograph sunset in Edinburgh, it was an image similar to this one that made me come up to Carlton Hill. I loved how you could see basically every iconic building in the city from this view. 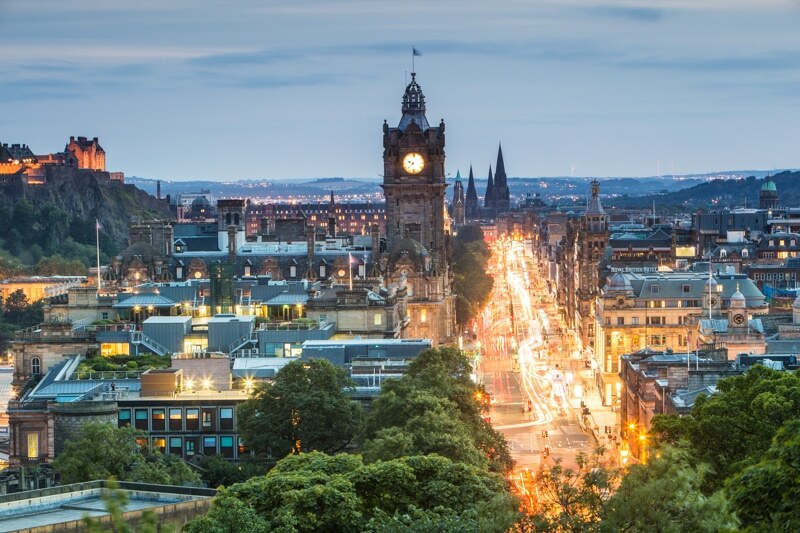 You have Edinburgh Castle, the Ferris Wheel, and everything else. So, when the light dropped from sunset light to blue hour, I headed up a little bit higher than our other locations to get this perspective. I took this picture at f/11, 30sec., ISO100 @110mm with my 70-200mm lens. What Camera Gear do you Need for This Shoot? Any camera body will work. I shot a Canon 6D (check it out here). You’ll definitely want a wide angle and a 70-200mm as well. I shot my 50mm, but it wasn’t necessary. My wide angle is a 16-35mm. Coming up on the blog, I’ve got another 2 posts coming from Kyrgyzstan. One will be a photography-related article, and the other some final thoughts to wrap up that travel photography assignment. Then, I’ve got a couple more articles from this trip up to Scotland and the Isle of Skye. And then, early September I’ll be heading back to Canada for a bit! Lots of fun coming up. If you are looking for some amazing tips for photography then this a must read.